An argument often made in support of bulldozing the wild banks of Buffalo Bayou in Memorial Park is that the area is not accessible. One response to that argument is if a rare and valuable natural area is destroyed in order to create access, what then would the people have access to? But the fact is that the riparian forest on the banks of Buffalo Bayou in Memorial Park as well as in the Arboretum is laced with official and unofficial hiking, running, and biking trails. Some areas with deep gullies and ravines (also called barrancos) are suffering from severe erosion due to uncontrolled runoff from the park and heavy use by hikers and mountain bikers, so be prepared for that. And be alert, because some of these steep, winding dirt paths are used simultaneously by hikers, runners, and mountain bikers. Also there seems to be some sort of weird Starbucks cult happening, as paper Starbucks coffee cups are planted all over the place. But the experience of the woods is restorative, the streams enchanting, and the views of the bayou are lovely. You can see jumping fish, herons and hawks, the tracks of bobcats, coyotes, and beaver in the sand. You’d be lucky to see an alligator, and let us know if you see one because we’ve heard of no sightings in this area in recent years since the famous big guy (or was it a hungry gal or both?) was removed from the beach farther downstream at the Rainbow Lodge. Here is a map of the official trails. And here is a map that shows some of the unofficial trails. To see the area targeted for destruction by the Harris County Flood Control District, start from the south-easternmost parking spot on the South Picnic Loop. Enter the woods and follow the trail to the right around the gulley for about fifty yards. When you get near the bayou, take a left and walk towards a steep sand bank. On the opposite bank is the upstream limit of the River Oaks Country Club golf course, marked by a picket fence on the terrace below the steep cliff. This and other high cliffs were recently relatively stable and in better shape before the club killed off the vegetation and began running bulldozers over the ground installing the newly designed golf course. (During the summer of 2015 the club armored this bank with concrete riprap, along with another high bank near the downstream end of the golf course that the club had also stripped of vegetation.) The entire south bank—half of of the project area–is owned by the club, which is paying one-third of the $6 million cost. You can back track and follow the footpath through the woods downstream (eastward), entering and crossing a lovely tributary that will be dammed by the proposed “restoration” project. Plenty of vantage points for looking out over the bayou and places to descend to sit on the shore. Note that the trees and brush downed by the 2015 Memorial Day flood are performing an important function: trapping sediment to naturally rebuild stronger and more stable banks. 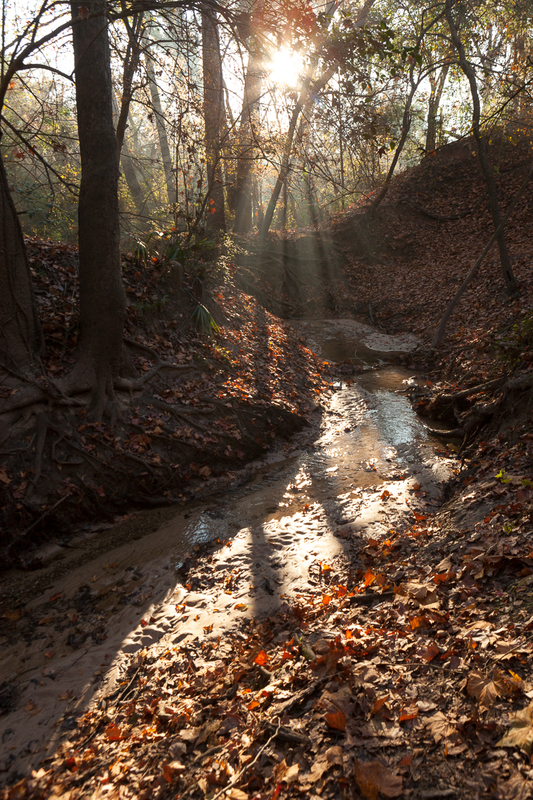 Like other west-east flowing streams in the Houston region, Buffalo Bayou is notable for its high bluffs, something that early visitors to the new town of Houston described in the nineteenth century. The eastern park boundary is a high cliff just east of another tributary and what we call the middle meander—a wide sandy beach southeast from the maintenance facility, off the Green Ridge trail, and deeper into the woods beyond a concrete cistern covered with graffiti. The cistern and other concrete ruins in the park are the remnants of Camp Logan, a World War I military training camp. The flood control project will obliterate these many-thousand-year-old cliffs, and the bayou here will be filled and rerouted further south. From here the north bank of the project is private homes, although the sandy banks themselves are owned by the Harris County Flood Control District and thus public property. Around a sharp point and with the recently armored south bank of the country club opposite, the north bank is part of the Hogg Bird Sanctuary, a city-owned public park, although there are private homes behind it. Soon you reach yet another tributary and the cliffs of the bird sanctuary. This area, once accessible by a footpath from the Bayou Bend parking lot off Westcott Street, suffered some severe slumping during and after the 2015 Memorial Day flood. These cliffs and tributary were to be obliterated by the project, but oddly the flooding bayou preempted the plan, re-engineered the steep cliffs into more more gently sloping banks, and left the downed trees and brush to gather sediment and rebuild and stabilize the banks naturally. And by the way, we have reliable eyewitnesses who grew up in the neighborhood and who say that the large tree trunk lying across the tributary, which like so many trees in the bayou looks recently fallen, has been lying there for at least thirty years. And it’s still there even after the Memorial Day flood. The end of the River Oaks Country Club golf course, visible through the trees and bushes of these steep, very old cliffs, marks the downstream limit of the project. When the river level is below 2 feet, you can walk virtually the whole way at bayou level from the Hogg Bird Sanctuary to the Woodway Bridge (essentially all public land on the right bank). A great way to see the landscape! Please note the lovely photo from Jim Olive above. This tributary is called “gully” on Sheet 16 of the draft project plans (https://www.hcfcd.org/projects-studies/buffalo-bayou-projects-studies/memorial-park-demonstration-project/draft-project-plans/); look just under the “N” in “Not for Construction”. The proposed engineering solution would dam this gully, and back up the second largest drainage from Memorial Park and the surrounding neighbourhoods, creating a swamp that would close off the “Renegade” running trail, and probably impact the Green mountain bike trail. For guys who are supposed to understand storm-water management, the HCFCD didn’t think this one through very well. It’s also important to note that gullies are considered erosional features and not protected by the federal Clean Water Act. But tributaries feed into the bayou, a navigable waterway ending in Galveston Bay. Tributaries are part of the vital nexus of streams and wetlands that circulate our waters and nourish us and our world. Did the Harris County Flood Control District deliberately label a tributary a gully to remove it from federal protection under the Clean Water Act? And why did the Army Corps of Engineers, which says it has reviewed the description of its jurisdiction in Flood Control’s permit application, approve it? The Corps is responsible for enforcing the Clean Water Act and protecting the health of our waters.